Hey guys, so I was just fooling around during some leisure time and started picking up Angularjs. I decided as a fun little project I'd make a single page web app based website. I've come up with this! ABXY Gaming. It's like IGN(geek culture news), ESPN(live scores and streams), and Kotaku (blogging) had a baby and put them onto a single page. It uses a combination of Angularjs and AJAX to load content without having to move to a different URL, drastically decreasing load times. Of course this is just still in the design phase and I'm not really looking to push it forward beyond a hobby level, but I thought it was a cool concept. 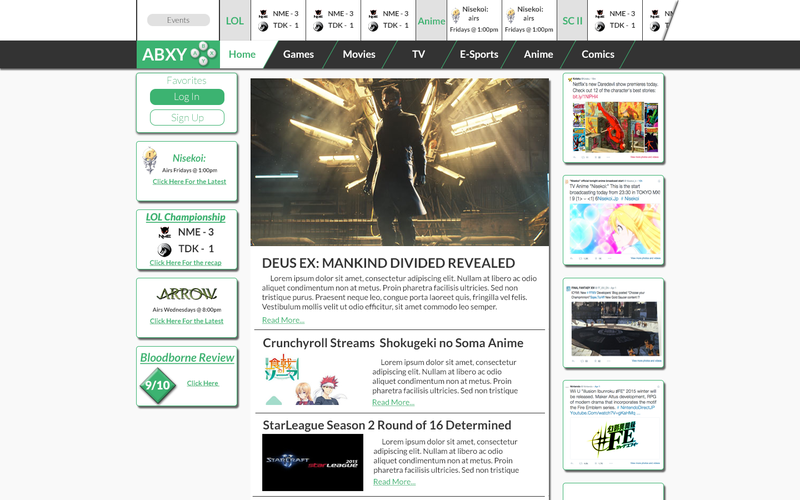 It would function as a place to get ESports scores, streams of matches, recaps, anime news and reviews, game news and reviews, along with TV and movies. It would allow you to sign in and store favorites, which would populate the left hand sidebar with relevant information, while the right hand sidebar was trending tweets in geek culture. Theoretically I was also thinking about a fantasy ESports league too. So what do you guys think? I'd appreciate any feedback on my design.